Figure 1: Set up of iv tubing, manifold, and downstream stopcock that could potentially allow for inadvertent aspiration if performed at the level of the stopcock and syringes are freely connected to the manifold. I am writing to describe an incident we experienced at The University of Texas MD Anderson Cancer Center that has implications for providers administering intravenous medications, particularly in the operating room. In order to add port sites to a blood set, a Quest Medical six channel manifold was placed in line and a stopcock was placed in the tubing between the patient and the manifold (Figure 1). Later in the case, blood was administered during an episode of hypotension and a 20ml syringe was connected to this stopcock to act as a pump, allowing the periodic aspiration and injection of blood. A sudden increase in blood pressure was seen and it was noted that a syringe of phenylephrine that had been left on the manifold was now empty. It was determined that 2ml of phenylephrine (100mcg/mL) had inadvertently been administered to the patient. The blood pressure response was temporary, within 20% of the patient’s baseline blood pressure, and started to fade within minutes. Figure 2: Aspiration downstream allowing the contents of multiple syringes connected to an in-line manifold to be drawn inside the iv tubing. 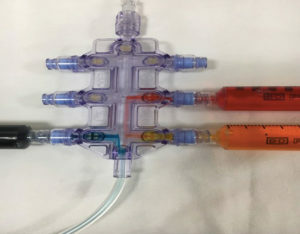 Providers should be aware that the possibility of downstream aspiration of medications is possible when syringes are left connected to certain types of manifolds, especially those without built in stopcocks. Figure 2 shows various colored dyes being pulled into a manifold when aspiration is performed downstream. Figure 3 demonstrates how contents from syringes left on manifolds with stopcocks (orange/red dyes) do not allow for downstream aspiration, while aspiration is possible with manifolds without stopcocks that have syringes freely connected to them (blue dye). This could lead to clinically important consequences, such as unintended medication administration. Providers should practice vigilance and disconnect any syringes from manifolds/port sites that are not actively being used to administer medications. Figure 3: Notice how contents of syringes connected to manifold with stopcocks are not aspirated downstream (orange/red dyes), but aspiration of contents from syringe attached to manifold without stopcocks is possible (blue colored dye). A unique method for actively pumping blood in an IV line has been demonstrated, which contained our MultiPort® manifold. A syringe containing phenylephrine drug was attached to the manifold. A second syringe was attached to the IV line downstream from the manifold and used as a “pump” to create negative pressure, which resulted in the liquid from the phenylephrine syringe being introduced into the IV line. The check valves incorporated into the MultiPort device are passive, or a “floating disc” design, which simply open or close based on a pressure differential. The purpose of a passive check valve is to prevent drugs/fluids injected from one port from entering another port on the manifold. A passive check valve will not prevent positive flow if a vacuum condition is created downstream from the manifold. Quest Medical concludes that the device performed as intended. Quest Medical does offer alternative manifolds that incorporate the use of positive pressure valves, which may be more suitable for your unique method of use. Thank you for providing feedback on the use and performance of our products. Our objective is to provide high quality medical devices. Your input is valuable in support of Quest Medical’s goal of continuous improvement.